(Monday, 07 December 2015) Mexican environmental authorities say they were able to lead seven beached dolphins back to sea but 16 others died. Twenty-one were pelagic rough-toothed dolphins and two were common dolphins (link). The mass beaching occurred at San Lazaro Beach on the Pacific coast along 1.2 kilometers (0.75 miles) of beach. We do not know the exactly location of this beach because there is no such beach listed on the Internet or on Goggle maps. What we really need is the exact time of the beaching, local winds and tides, and the location of the beach. This is rarely provided by the media making our job difficult. If you know where this beach is, please send us the lat/long numbers so we can better plot the flow of the surface current. As the story goes, local fishermen and coastal watch activists "helped save 7 of the dolphins" despite strong wind and waves. Obviously the strong wind and waves were washing ashore, not washing back out to sea. An even more obvious, how can they say for sure that they SAVED 7 dolphins if they have no idea why they beached in the first placed. More likely than not, the act of pushing 7 dolphins back in the water was nothing more than feeding the local sharks. The second choice was a 5.6 magnitude quake along the CENTRAL EAST PACIFIC RISE that occurred on 2015-11-11 (local time: 00:26:33.1) near 9.17 S ; 108.73 W (link). The event was defaulted at 10 km below the ocean's surface. The epicenter was 2071 miles South of Mexico City and 2248 miles southwest of the southern tip of Baja California, again within the range and time frame to account for this stranding. Here is an ocean chart of the epicenter. You can see that if the injured dolphins followed the EAST PACIFIC RISE northeast, they would end up inside the Gulf of California and very near the stranding area. The quake above was located near where the Bark "Prospector" was hit by seaquake on the 1st of September 1868 (link). One these quakes generated potent pressure waves that induced sinus barotrauma in the dolphins and knocked out their acoustic sense of direction. 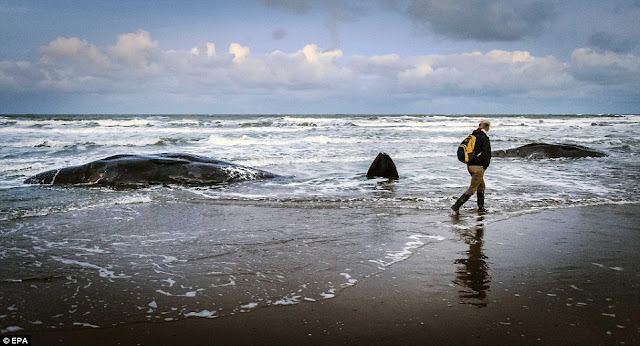 Form the point of injury, they swam downstream until the wind and waves eventually washed them ashore at San Lazaro Beach on the Pacific coast. The stranding site was located in a general downstream location from these two earthquakes. But the path is not direct. They were likely guided in closer to Guatemala and then swung north along the coast to the Baja Peninsula. The currents change sometimes hourly so it's hard to make a strong case for any exact swim path. Everything depends of local storms, small current eddies, and etcetera. I like the second event but can make a case for either quake.